It’s this time of the year again; at least in the APAC region. 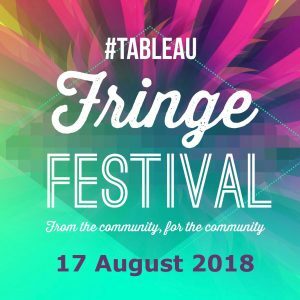 The Tableau Fringe Festival is scheduled for the 17th of August and we (yes I am part of the team this year!) are looking for speakers to make it a great event! Let me tell you why you should definitely apply as a speaker and give you some examples from my experience being involved with the DataViz community and presenting at TFFAPAC last year! Preparing and presenting a talk is fun! It’s not one of these monthly business presentations which you have to deliver to your boss! It’s your talk! You can talk about whatever you want (within reason), however you want (within reason)! You can be as funny or as serious as you like, you can talk as much or as little as you like! “But all the things I talk about are super boring!”, I can hear you say. My answer is “There are no boring topics, just boring presenters!”. There is a huge audience out there from people who just started using Tableau to Zen masters. Whatever you want to talk about, there will be people who will find it interesting and if you make your presentation interesting, the topic becomes interesting! How often did you look for a review of something on Youtube and ended up wondering when the presenter would finally come to the point rather than focusing on this completely useless feature? Even if you talk about your daily work, you will learn something during the preparation. You will need to consider your audience and think about your work in ways that you didn’t before. You might do a bit of research and deepen your knowledge about a topic and consider different aspects or point of views! Even the simplest techniques need to be learned at some point. Setting up a sheet swap is easy? Creating a Sankey is doesn’t challenge you? Sure once you know the technique it’s not a problem any more but until you know it, you wouldn’t even think it’s possible! Things you consider obvious might be completely new to others, independent of level. I prepared a “Things I should have known earlier” talk after using Tableau for 2 years. The amount of features I (and most of my audience) didn’t know about was staggering! The excitement for a couple of days before a presentation not even 12 months ago was crazy. By now, after regular on- and offline presentations I approach them a lot more relaxed! … you can be an expert! With so many different aspects of Visualisations, Data and Tableau there is definitely a niche where you can be the expert! Maybe you do great tooltips and can give tips on that. You might have a great eye for colour and can explain to people how you pick yours. Tableau Prep is out for a month or so, there are literally no experts out there yet! I wrote a quick blog post about how to do LODs in Tableau Prep because it was a feature people were missing. I used the tool for a couple of hours only but Tableau actually featured it in their blog! … you will be heard (and maybe seen)! You have a stage to present your work, your projects and yourself. Make use of it to talk about an initiative you started or show what you have been working on recently. You become part of a community very quickly. Next time you go to a conference, a Data Day Out or participate in a #MakeoverMonday on Twitter, people will remember your name and somebody might follow up with questions. At a recent event I asked a few people to catch up purely because I passively followed their output on Twitter, Blogs, etc. They were great situations and now I am helping to organise the Fringe Festival! … you can build your profile! Eva Murray gave a great talk at last years #TFFAPAC about building your own brand. Even if you don’t need it right now, building a public profile can help you in the future, negotiating your salary, getting a new job, finding opportunities within the community which you didn’t even think about yet. Through Twitter I ended up in a random discussion which kicked off a small project (still in the making) with somebody I never met in person! … your are awesome and people should know it! There are probably a whole lot more reasons why you should present at an event like the Tableau Fringe Festival but these were the ones which I found most important! If you are not sure what to talk about, how to approach a topic, how to structure your talk or anything else, just get in touch with me and I’ll try to help as good as I can. 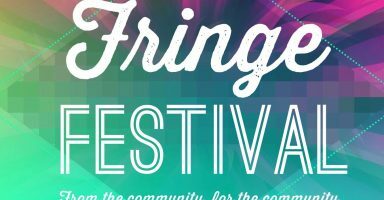 Otherwise, head over to the thefringfestival.rocks and apply as a speaker! We are looking forward to your applications!